Cooling · Evaporation · Devolatilization · Reaction SC Processor | Product Information | KURIMOTO, LTD. The SC Processor is a self-cleaning type heating and cooling equipment, which can process various kinds of materials, such as adherent and high viscosity materials ranging from liquid to slurry and powder materials. 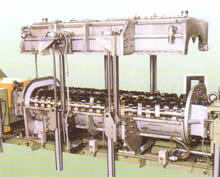 The SC Processor has hollow type screw and paddle on two shafts, which counter rotate. The SC Processor circulates heating medium through hollow type screw and paddle and also barrel jacket, thus providing a larger heating surface area. Furthermore, the SC Processor has an exclusive chamber on the upper part of barrel to provide a higher evaporation capacity. 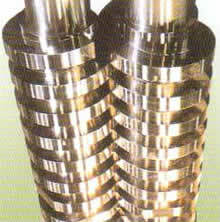 Continuous kneader that has had a problem in the devolatilizing performance due to closed barrel. Homogeneous heating with the larger heating surface area The screw and paddle are of hollow structure and heated with the heating medium along with the barrel jacket. High degassing performance The upper part of the barrel is open throughout its length, thus providing a larger area to de-gas moisture or solvent. No adherence of sticky materials Stable operation is ensured by the employment of self-cleaning type paddle. Processing with a big phase-change by a single unit The paddle can perform self-feeding of a variety of materials from high viscosity materials to powder. Sharp distribution of stay time This Processor has less dead space, and all paddles are provided with a feed function. Operation under reduced pressure Viscous materials can be devolatilized by pressure reduction inside the Processor.